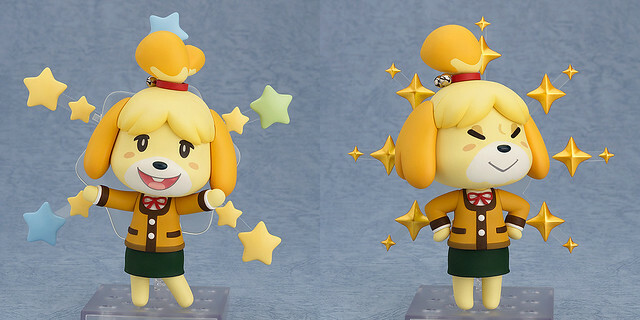 So you have already got your hands on the Nendoroid Shizue (Isabelle)? Well, as you might have known, there is a winter version of her being in the production for weeks and she is finally announced today. Your very own personal secretary is back in her Winter uniform! From the popular 3DS game ‘Animal Crossing: New Leaf’ comes another version of Nendoroid Shizue, this time wearing her long sleeved outfit from the Autumn and Winter months! She comes with both a cute smiling expression and an ‘ahem’ expression – which can be combined with the included effect parts to recreate the adorable pause menus! She also includes arm parts that can be used with the previously released ‘Nendoroid Shizue’, giving you even more options when displaying the two seasons together! Nendoroid Shizue (Isabelle): Winter version from the popular Nintendo 3DS game Animal Crossing: New Leaf is scheduled for April 2014 release and priced at 3800 Yen. It seems that Nendoroid Yatogami Tohka will be released shortly, or to be exact, December 5th, as Kahotan posted a review of the production sample for this lovely Nendoroid from the Date A Live series. Anyway, there is one more interesting thing revealed in Kahotan’s post. Oh … that voice! 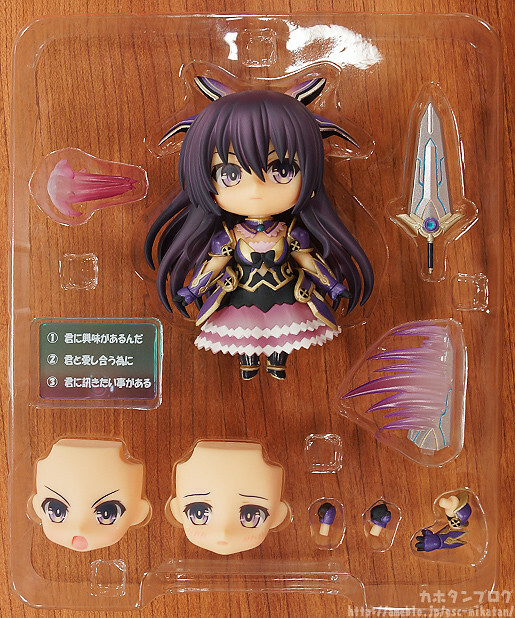 Is she the next Nendoroid in line from Date A Live series? 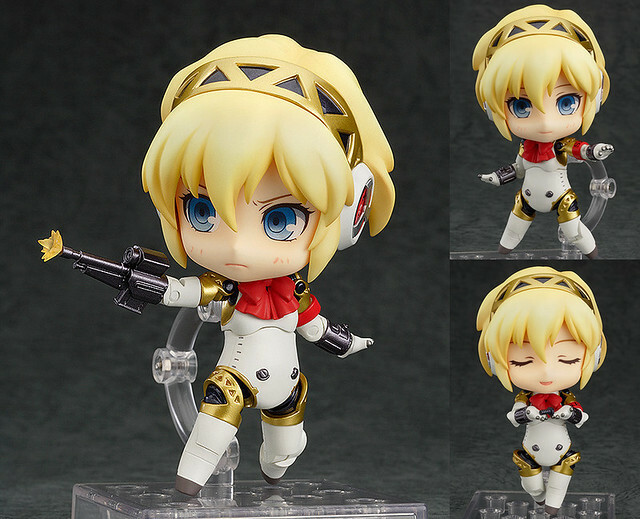 I know that many Persona fans have been anticipating to see Aigis/Aegis from Persona 3 being converted into a cute Nendoroid – some folks even went the trouble to make a custom one! 7th Generation Anti-Shadow Suppression Android: Nendoroid form complete. From the popular RPG ‘Persona 3’ comes a Nendoroid of Aigis! She comes with three different expressions including her standard expression, an upset expression and a smiling expression. A number of weapon parts seen in the series are all included as optional parts, and she is also fully articulated to recreate all your favorite action poses from the series! The ‘Charred Screw’, a key item to Aigis, is also included. She will be available on April 2014, priced at 4000 Yen. If you are still unsure whether or not to get her, then you might want see some close-up shots as well as the usual “preview” up on Kahotan’s blog. We have already known that Nendoroid Akagi will be the next Nendoroid from Kantai Collection (a.k.a KanColle) after Nendoroid Shimakaze, and it seems that the Nendoroid production is making progress steadily as the prototype has already been displayed at Good Smile x Karaoke Tetsujin Cafe. In any case, you can see more pics of her at AkibaHobby. *ahem* As we have known, Nendoroid Irine from the popular MMORPG Dragon Nest was initially announced a few months ago, but it was mentioned that she will be released exclusively in China. Fortunately, the adorable NPC is now available for international pre-order as she starts popping up in various online figure shops. Your friendly guide to the world of Altera! 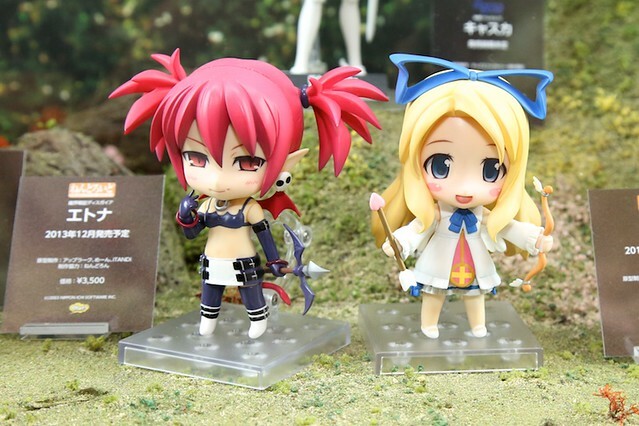 From the popular MMORPG ‘Dragon Nest’ comes a Nendoroid of the idol-like NPC, Irine! You can pose her in many cute poses from the game, such as waving her hands as she sees the player off with a smile, or sending out some encouragement by blowing her trumpet! Her big trademark hat and cape are both included, but can be also be removed whenever you like, allowing you to create a number of your favorite scenes from the game! Her updated pricing is 3909 Yen and she is going to be released on April 2014. Yep, Nendoroid Kanbaru Suruga is the third character from Bakemonogatari series to join the Nendoroid army lineup. In case you forgot, the previous two are Nendoroid Senjyogahara Hitagi and Nendoroid Hachikuji Mayoi. The third character to join the Bakemonogatari Nendoroid series! From the popular anime series ‘Bakemonogatari’ comes a Nendoroid of Suruga Kanbaru! Optional parts include one of the key items from Kanbaru’s story, the ‘Devil’s Paw’ as well as a basketball to show her off as the ace of the Basketball Club! An entranced expression, a number of books and sitting parts are also included to pose her absorbed in her reading – all sorts of parts allowing you to recreate various scenes from the series! Be sure to display her with the other figures in the series to fully recreate the Bakemonogatari universe! The chibi playful basketball ace is priced at 3800 Yen and scheduled for April 2014 release.